Boost visibility and safety in low light with night running lights. 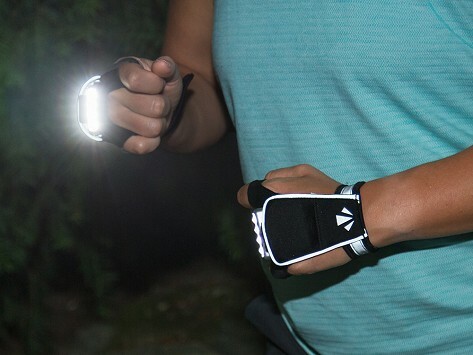 Inside each Hand-Sling, a rechargeable LED shines a 135-degree radial arc of light up to about 30 feet ahead of you. The low-profile design fits like a glove (literally) without adding bulk—whether you’re out for an early morning jog, an after-dinner dog walk, or on your evening commute. Dimensions: 11" x 4.5" x 1.25"
Best light ever for running! Perfect for not only running, but also working on cars!!! Mary Tiffin needed night running lights because she was jogging after her kids were in bed. When she couldn’t find lights that suited her, Mary invented RunLites (now MangataLites) fingerless gloves and Hand-Slings. 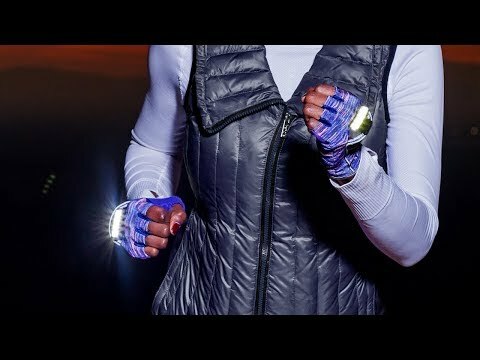 Her designs are low-profile, breathable, and lightweight, with a rechargeable LED light tucked into a pocket on each hand. The lights illuminate an ultra-bright, 135-degree arc up to 30 feet ahead of you. And on a single charge, each light can shine for 48 hours of use. We tried the gloves while running and biking, and were impressed with their comfort and brightness, which helped us see—and be seen—better. We think the gloves are a smart addition for anyone out and about in low light, like early morning dog walkers or post-bedtime runners like Mary.